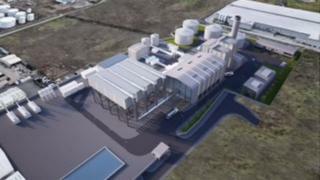 Senior civil servants have approved plans for a £300m gas-fired power station to be built in Belfast. The Department for Infrastructure (DfI) issued a 'notice of opinion' on Monday. The Belfast power station will be based in the city's Harbour Estate and will provide energy to about 500,000 homes and businesses. It is the third large-scale planning decision to be made without ministerial approval in recent months. In February, the department granted permission for a 16-storey office block to be built at City Quays 3. While last week, it issued a 'notice of opinion' for a Transport Hub in Belfast. Before a final decision is made in relation to planning proposals, the DfI is required to serve a 'notice of opinion' - an indication of the final decision it proposes to make. After this, the applicant or council has 28 days to request an appeal. If this does not happen, the department issues its final decision. Northern Ireland has been without devolved government since January 2017, following a bitter row between the DUP and Sinn Féin. As such there are no ministers in place to make decisions. Legislation was passed at Westminster in October last year, giving Northern Ireland civil servants more legal clarity to make decisions while political deadlock continues. In a statement, a spokesperson for the department said officials were working to "progress planning applications" so they are ready for a decision to be made. "The department will consider on a case by case basis what decisions it is appropriate for senior officials to make in the absence of ministers." They added that all such decisions are made inline with the Northern Ireland Act 2018 "and the associated guidance issued by the secretary of state". Belfast Power Limited's Director Ciaran Devine welcomed Monday's announcement, adding that the department had "been thoroughly professional in its approach to the application". "The project also represents a significant shift towards low-carbon electricity generation in Northern Ireland," he added. Meanwhile, Kirsty McManus from the Institute of Directors Northern Ireland said the fact decisions had been made by the DfI reflected "the strong leadership of its permanent secretary".